Here lies the body of Mr John Blackadder, minister of the gospel at Troqueer, in Galloway, who died on the Bass, after five years' imprisonment, Anno Dom. 1685, and of his age sixty three years. Laid up for those who faithful are till death. Zeal warmed his breast, and Reason cool'd his head. To be confined to jail, or flesh and blood. Blest soul, thy warfare's done, praise, love, enjoy. Even so, blest Jesus, come come, Lord Amen. The stone was restored in 2009 using funds provided by the SCMA. 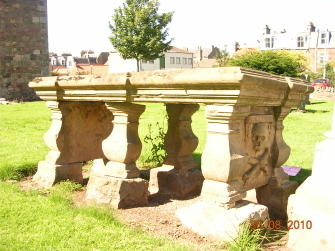 Rev John Blackadder was the lineal descendant and representative of the ancient family of Tulliallan, from whom he inherited the title of knight baronet, however he didn't use it. He was appointed minister of Troqueer, near Dumfries, in 1652, where he served until November 1662, when, by the Act of Council, he was outed for his conscientious adherence to Presbyterian principles. He continued to preach in the fields, and his conventicles were extremely popular. On 25 January 1666, letters of Council were directed against him and other ministers for presuming to preach, pray, baptise, and performing other acts. He escaped to Holland, where he placed his eldest son at Leyden, to study for a physician. He later returned to Scotland, where he was apprehended on 5 April 1681, when in bed at his own home in Edinburgh He was taken before the Council and sentenced to be imprisoned on the Bass Rock. The cell in which he was held is still pointed out, with its three small iron-barred windows to the west. Being now quite aged, and with a poor constitution, his health became seriously impaired. After four years' imprisonment, a petition was presented for his removal, but this was refused. A second application succeeded, but before it could be carried into effect, he died. He was 63 years old. 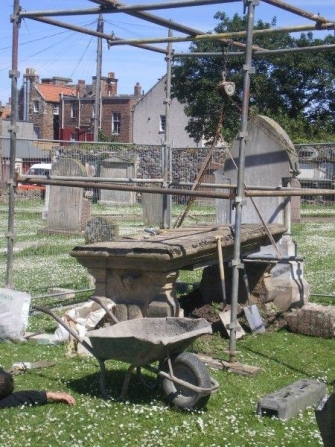 Blackadder's body was brought to the mainland at North Berwick, where he was buried in the kirkyard.